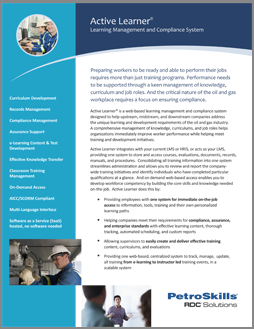 The process manufacturing industry faces unique learning and compliance requirements. Active Learner® is more than just a learning management system. It is specifically designed for the compliance-focus required of oil and gas companies, and provides the assurance they need. 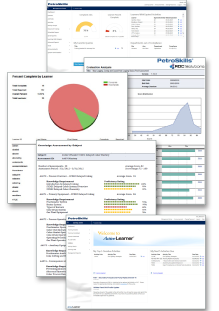 Active Learner is one system to store and access courses, evaluations, documents, records, manuals, and procedures. Consolidating all training information into one system streamlines administration and allows companies to review and report on enterprise-wide training initiatives and identify individuals who have completed particular qualifications at a glance. On demand web access enables learners to develop competency by building core skills and knowledge needed on the job. Develop and manage job/role-specific course curriculum including pre-requisites, re-training, and alternate courses. Plan, schedule, track, grade, and document with custom reports to keep management informed and supportive. Automate compliance requirements and plant-specific mandates with comprehensive reporting. Learn about Analytics. Create valid course content and evaluations quickly using proper instructional design methods using templates. More about Evaluation Center. A multilingual learner interface is available in 12 languages including English, French, German, Spanish, Arabic, Russian, and Chinese. Environment integrates seamlessly with existing LMS/ERP systems. Comprehensive tracking and reporting show progress towards compliance goals.